With the holidays approaching I see a lot of requests for appetizer recipes. I LOVE appetizers and could easily make a meal out of them. To check out all of my appetizers, click here. I have a nice mix of dips, spreads, cold, hot, easy, and fancy. 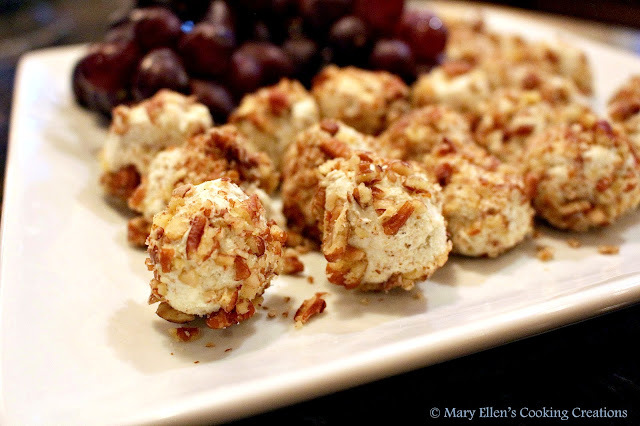 These Gorgonzola Truffles were super easy to make. The original recipe called for coating them in bacon - doesn't that sound heavenly? I am a strong believer that bacon makes everything better, but the ONLY reason I didn't not use bacon was because I already had bacon in another app. I thought pecans (or walnuts) would be a nice change. I made these a bit smaller than the recipe recommended, and the next time I'd make them even smaller. They are very rich and it would be nice if they were truly one-bite. What I loved about them is I could prep the mixture the day before and roll them into balls once the mixture was firm. Once I was ready to serve, all I had to do was roll them in the pecans. Beat the first 5 ingredients at medium speed with an electric mixer until well combined. Cover tightly and chill at least one hour until firm (or up to 3 days). Roll the cheese mixture into balls (I recommend 1/2 inch). Roll in the nuts and serve immediately. What a yummy looking recipe. I do love me some stinky cheese - and one bite at a time would be awesome. I wonder if the bacon would actually detract from the gorgonzola - I think rolling in nuts was a GREAT idea!